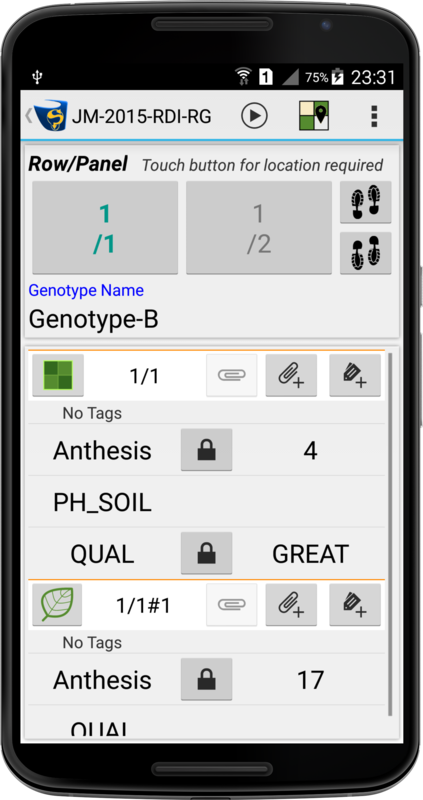 KDSmart allows you to score Traits (usually phenotypic information but you can score anything you wish) for a Trial. The scoring panels that are presented allow you to make measurements very quickly - usually a single touch. The Trial's name is displayed on the KDSmart main screen. Just touch the button or the Trial name to continue where you were previously scoring. 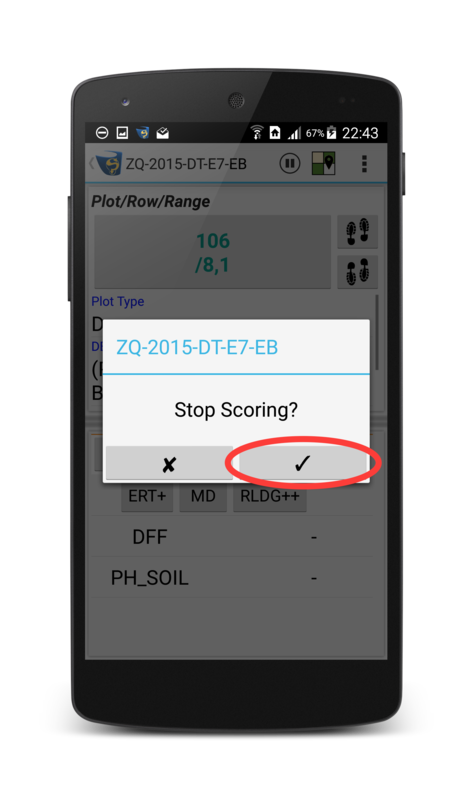 KDSmart remembers the Plot you were at when you exited the Scoring activity (see the next section) and will present that Plot to you. Use the and buttons on the main screen to change to the visibility setting. This visibility setting will be used if you use one of the first three buttons on the main screen to manage the Trials, Traits or Tags. or you can define three Instances of the single trait Leaf_Length: Instance 1, Instance 2 and Instance 3. Which corner of the field to begin: the four quadrants separated by the grey bars identify the corner of the field where you will begin walking. You can choose more than one Plot at a time; e.g. working to the Left and then Right of the path you are walking through the field. This helps to prevent accidentally overwriting Traits that have already been scored. You can still change the measurements but more screen touches will be required. Otherwise KDSmart's high speed scoring technology might allow you to change values you really didn't want to. The default dark background used when managing data in KDSmart does not work well outside in bright sunlight. This option presents the scoring panels with a white background this reducing the reflected glare. 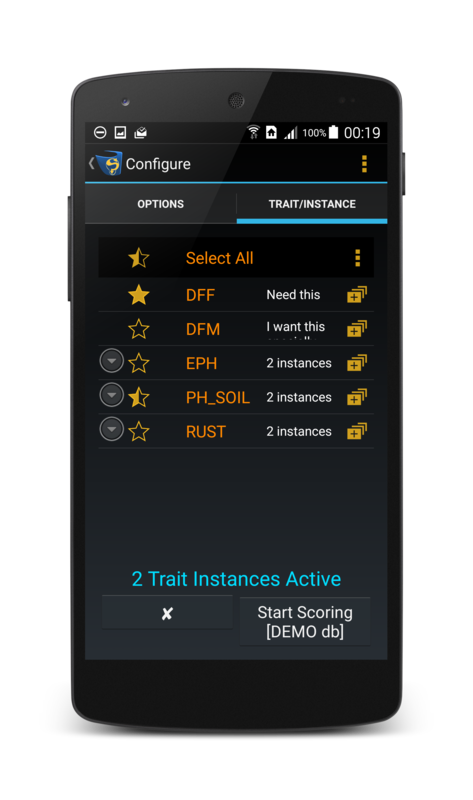 Touch the "TRAIT INSTANCE" tab at the top of the screen or Swipe left to see a list of the Traits that have been assigned to the Trial. You may then choose which of these (and in which order) you wish to score them in the current Collection or Scoring activity. 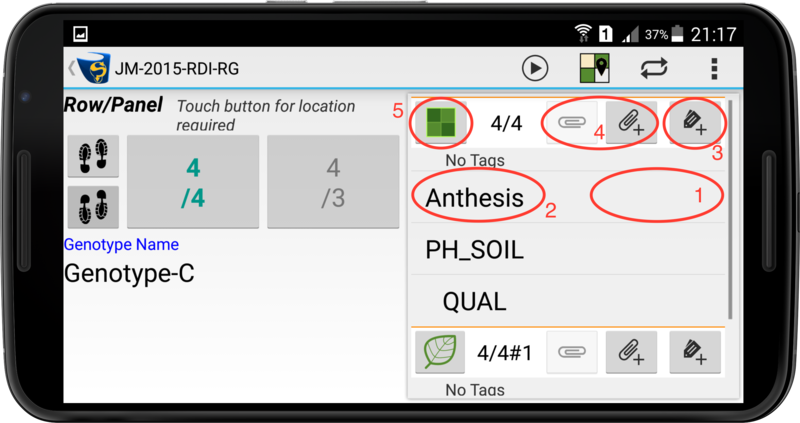 KDSmart may contain many Trait definitions and only some of these are assigned to the Trial that you are scoring. Of those that are assigned to the Trial, you do not have to provide measurements for all of them. 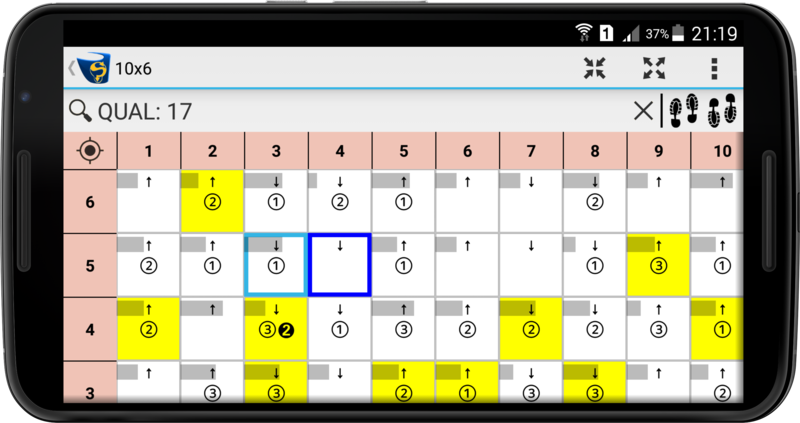 The filled in stars identify Traits that will be Active for scoring in the current Collection. Hollow stars mark those that will Inactive for scoring in the current Collection. Touch the stars to change them. as the scoring may be performed by working from the top of the plant to the bottom. The order in which the Traits will be presented is the same as that on display here. To change the order touch the buttons on the right edge of each row. The ones next to the Trait Name will allow you to move the Trait up or down one position. The menu presented by the allows you to drag the Traits into the desired Scoring Order. KDSmart lets you use the device in either Portrait or Landscape orientation (assuming that you have turned off the "Orientation Lock" on your device). The orientation that you are holding it in when you touch the Start Scoring or buttons determines how the scoring screens will present. Above is a Trial being scored on a Phone-sized device in Landscape mode with a "right-handed setup". Below is the same Trial on the device but now in Portrait mode. Left-handed setup: the scoring and navigation controls are moved to the left side of the screen. Right-handed setup: the scoring and navigation controls are moved to the right side of the screen. If you have been scoring a Trial, its name will appear along the bottom of the main screen with a button to the left. If you are having difficulty reading the screen because of glare, use the button to switch to a white background. The icon changes to to let you change back. If you see the button on the main screen then you are using the Demo database. When the Configure screen is presented, the Start Scoring button contains [DEMO db] at the bottom. The button demonstrates the Lockdown mode of operation. Use this when you let someone else perform scoring but that is ALL you wish them to be able to do. To exit Lockdown mode they have to provide a four-digit passcode. When the Production database is active, you enter Lockdown mode from the Settings page: . This is pre-populated with dummy data when you install KDSmart so that you can experiment with the application and test the functionality before you begin to work with your own data. You can reset the Demo database at any time using the Settings screen; use the button on the main screen to display the Settings and choose the Reset Demo Database checkbox. When you return from the Settings screen KDSmart will switch clear the Demo database and re-populate it with dummy data. This is the database where you place your real work. KDSmart starts with no records in this database. To being using the Production database, touch button on the main screen to display the Settings screen and choose the Active Database preference then choose the Production option. When you return from the Settings screen KDSmart will make your selection active. When scoring a Trial, KDSmart begins in the corner of the field and proceeds in the direction you have chosen for the Collection Order. the empty space next to a Trait name to popup a dialog to enter the Measurement value for that Trait. the Trait name to see the description of the Trait. the button to add or modify the Tags that you wish to apply to the Plot. the and the to take a picture attachment for this Plot. button to add or modify the Tags that you wish to apply to the Plot. the to change the state of a Plot from Active to Inactive. 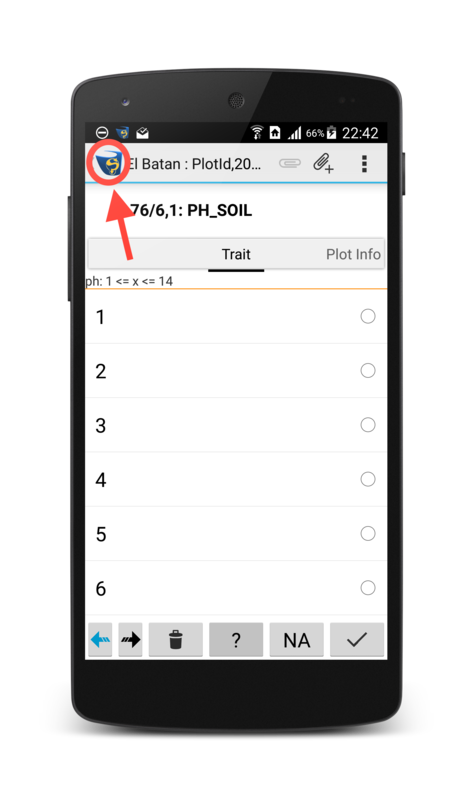 If a Plot is marked as Inactive you can still modify the Tags but all of the Traits will be hidden. the button with the Plot identifier to popup a dialog which lets you choose another Plot using its identifier (e.g. Row/Range). one of the footprint buttons to advance to the next Plot or retreat to the previous Plot. If you are using more than one Plot in a group then the advance/retreat will be to the next or previous group. 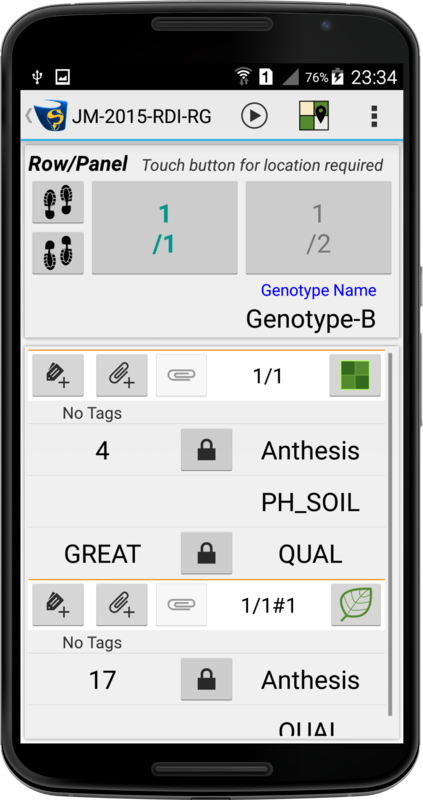 Auto-advance allows you to concentrate on only those Traits for which you have not yet provided a Measurement value. 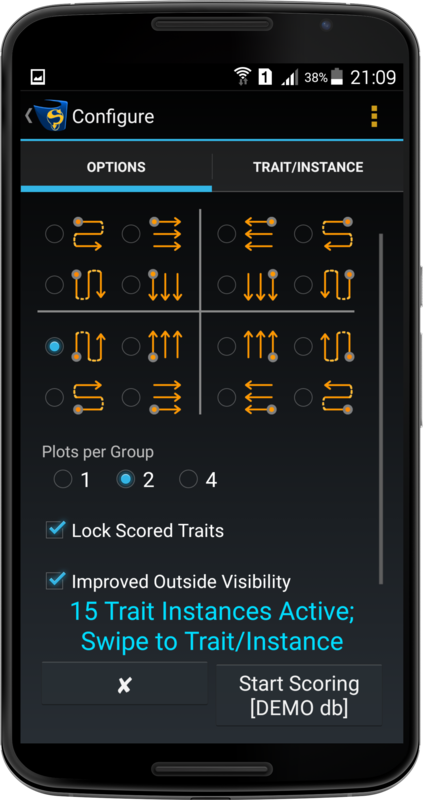 When you provide a value for a Trait, KDSmart moves the focus to the next un-scored Trait, skipping over those Traits (and sometimes entire Plots) which have already been scored. Touch the button in the menu bar to turn on Auto-Advance Scoring. Begin scoring by touching the blank area next to an un-scored Trait. 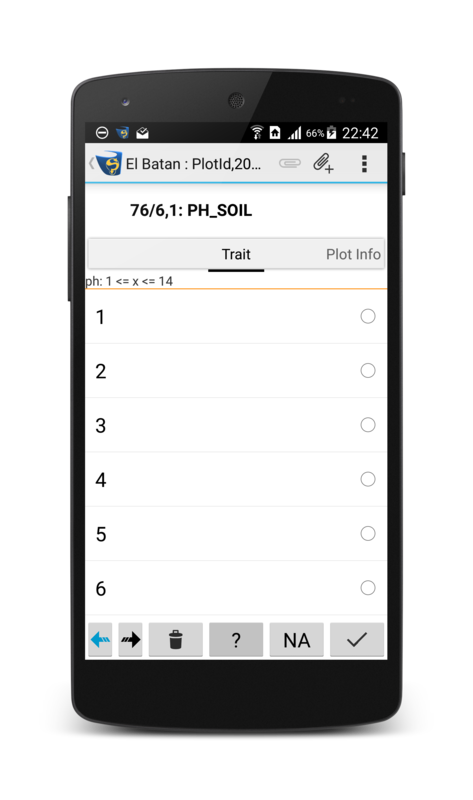 KDSmart will bring up a new screen with the data entry "form" for the Trait on one side and the Plot Information on the other side. 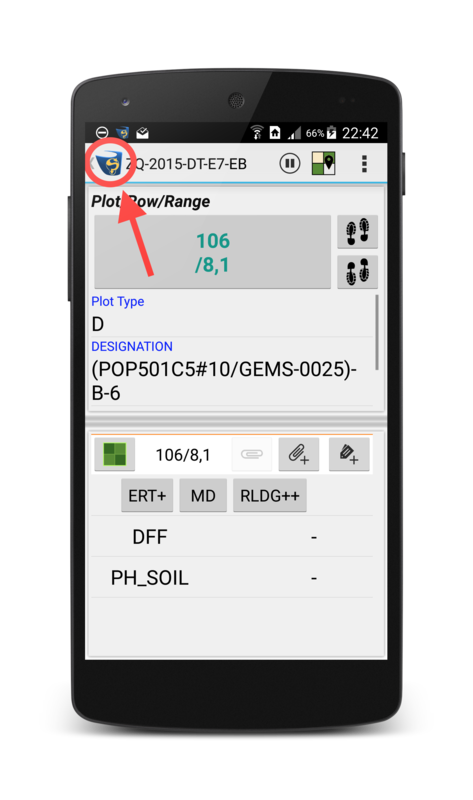 The Plot identification buttons and the advance/retreat buttons are no longer available but there are skip-backward and skip-forward buttons along the bottom that may be used if you don't want to enter a Measurement for the Trait being displayed.